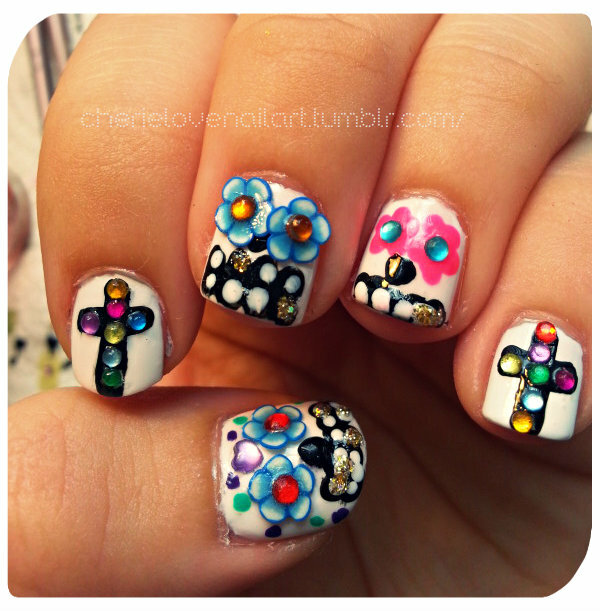 Day 3 of Reader Nail Art Week has skulls, and zombies and studs! Some great ideas guys- keep those submissions coming!! • Send to thedailynailcontest@gmail.com ONLY. These are the ONLY submissions I will accept. I've been so inspired by your nail art designs in the past years. 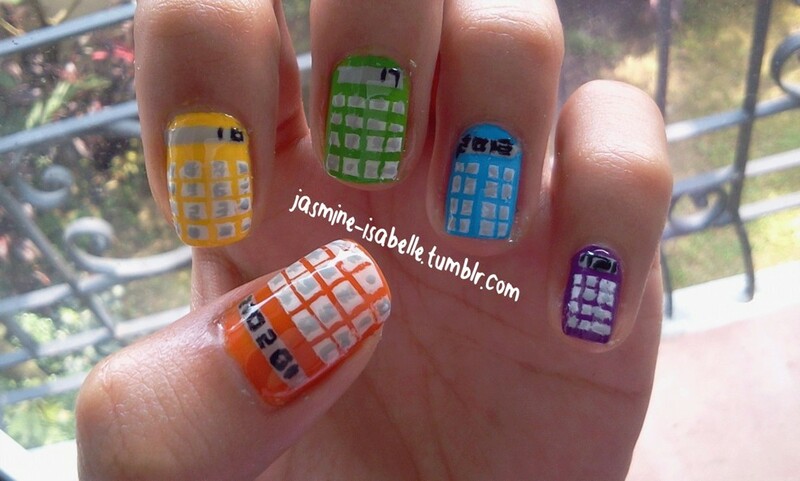 I really started getting into nail art because of your designs, so thank you for being you! I did this design earlier this year for Valentine's Day! I was inspired by watercolour backgrounds and added some hearts to make it more Valentine-y. It's not really supposed to be anything, just sweet pink and full of hearts. My name is Christine and this is my 1st time entering a nail art contest so I thought what a good time to do it because I love your blog. I'm all the way from South Africa and this is my work of art entitled Colourblock. I was inspired to do this design when my nail studs finally arrived in the mail. 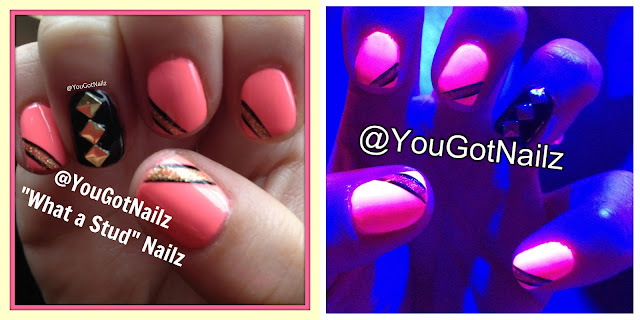 I started with one of my favorite neons: China Glaze's Flip Flop Fantasy and added studs. Then my grandmother told me I needed to add glitter! 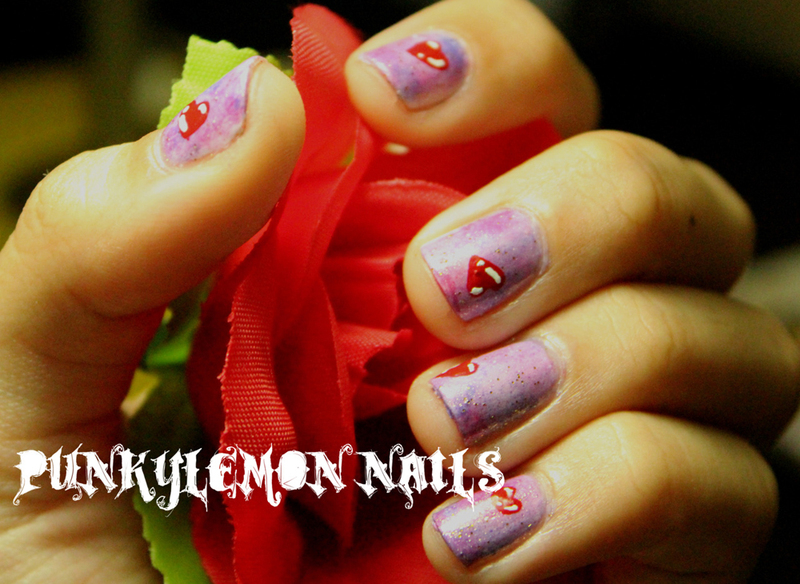 And viola, this totally studly manicure was born. The next day I went to Disneyland and I found out that this design looked awesome under black light! 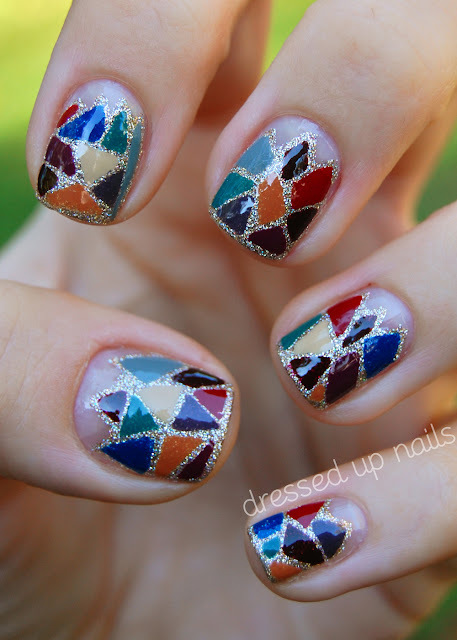 call these fall mosaics! The inspiration behind them was (again) the China Glaze On Safari collection... I seriously can't get enough of these colors, I think I have a problem. They're just so amazing and they all go so well together. 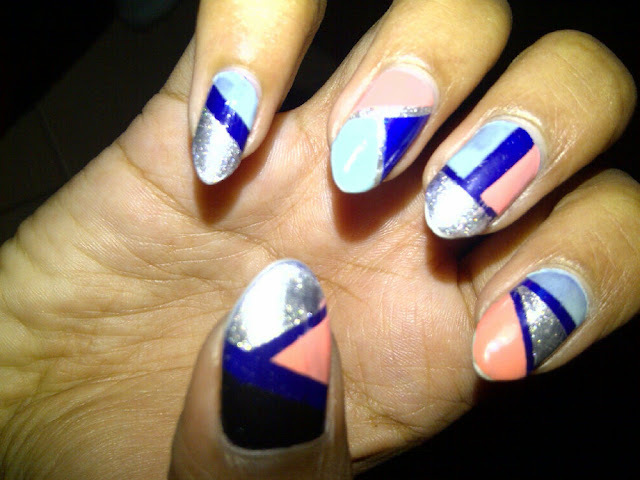 I used 11 of the 12 colors in the collection for these nails! I think they look kinda like stained glass, too. I painted the glitter on first and then freehanded the shapes on top of it to create the mosaic effect. 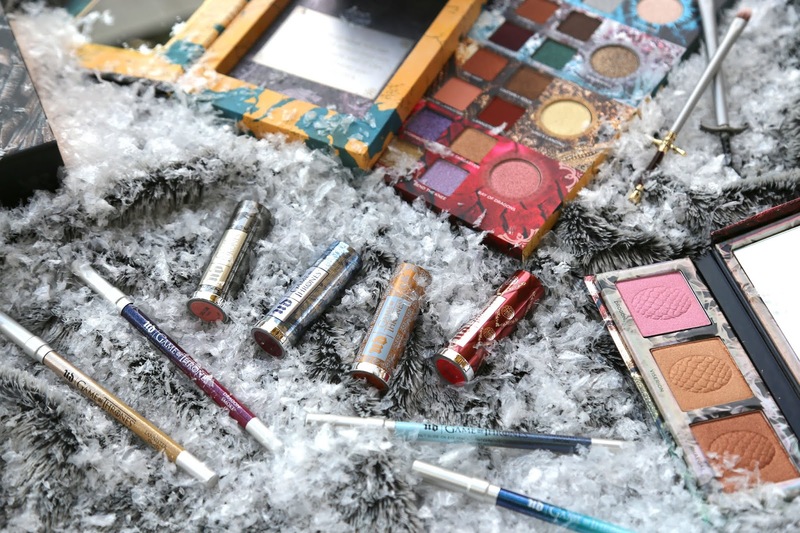 Glitter makes everything better, in my opinion. 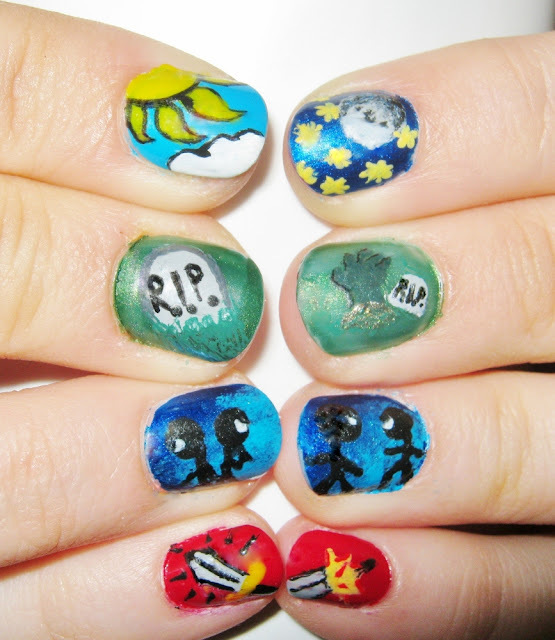 These are my zombie nails. I was inspired first by your Let it slide manicure, in which instead of doing the super cute Halloween nail art you went for ugly and disgusting, and that's super cool! 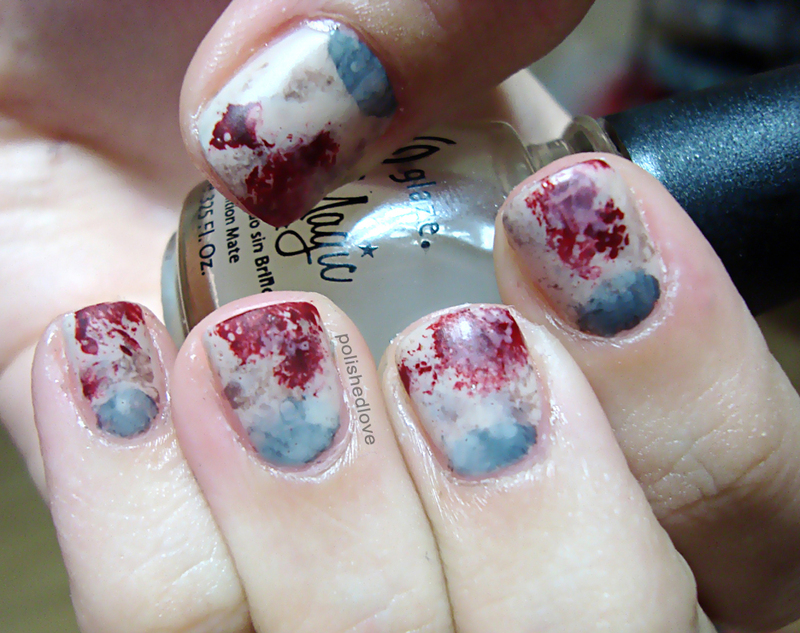 Then I saw Samarium's blog where she created ugly dirty zombie nails. I think these two manicures are more Halloween-ish than the cute pumpkin patch ones. And I kinda like when people ogle my nails in utter disgust. 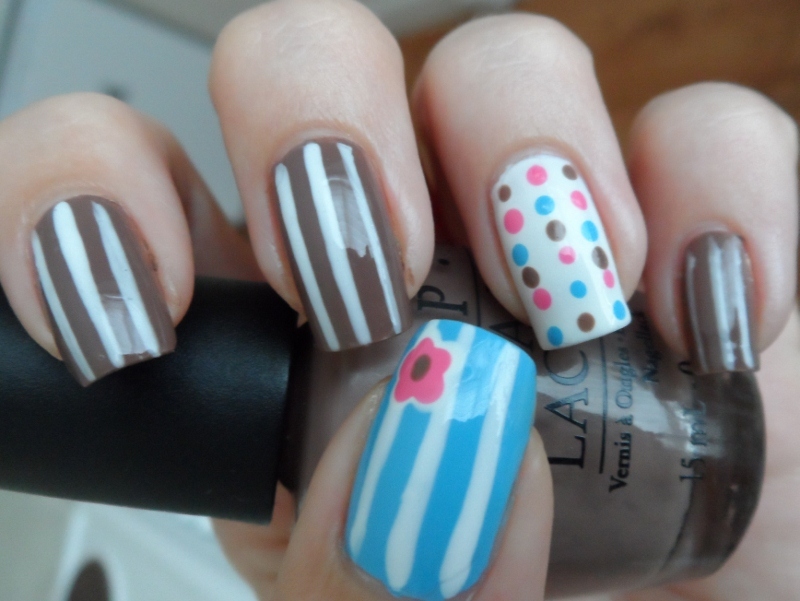 I wanted to create a manicure using OPI's lovely chocolatey-brown Over The Taupe. 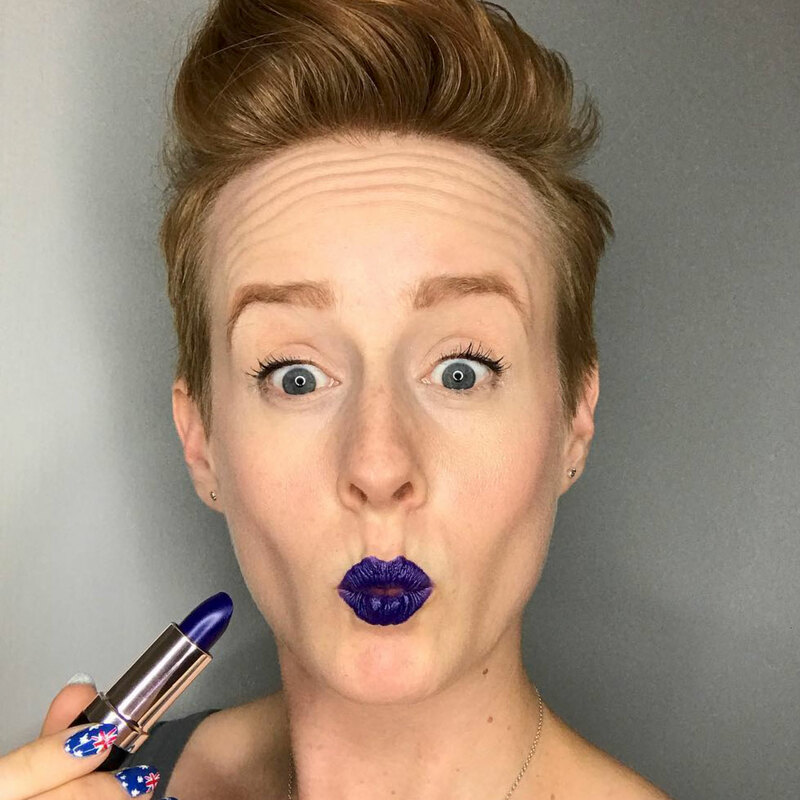 I thought blue would go nicely with it, and this manicure was born! 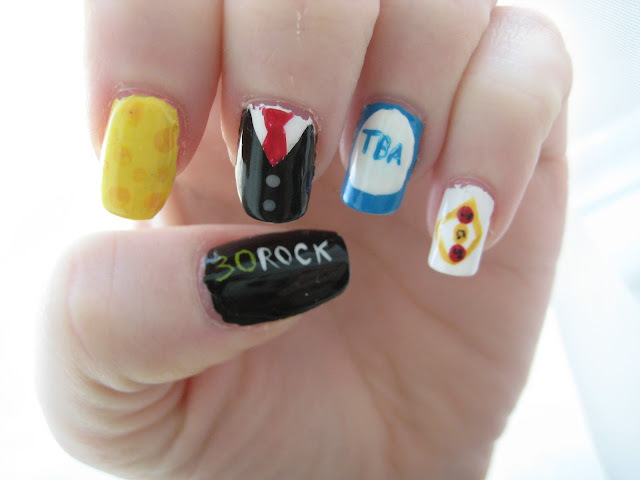 30 Rock - Julie M.
Inspired by the show 30 Rock, my left hand shows some Night Cheese, Jack's Suit, Frank's Hat, and the TGS logo! Backwards Poem - Laura N.
Did these for a Creative Project for an English class. It goes along with a nonsense folktale... poem. drew their swords and shot eachother." Two dead boys got up to play. Came and killed those two dead boys. I can't believe it. 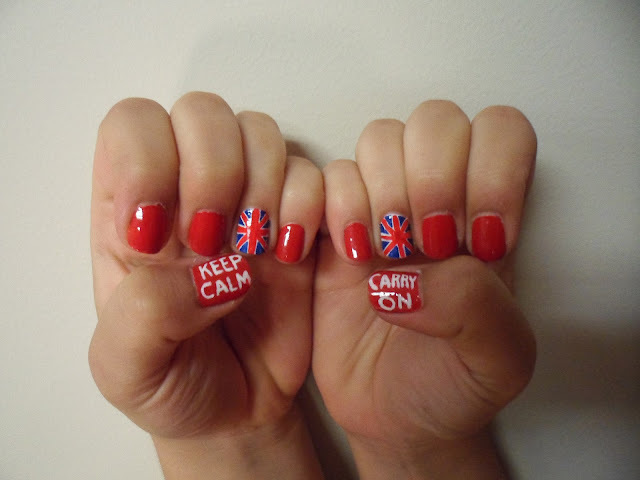 My nails are on The Daily Nail. That alone makes me feel like a winner. So stoked, thanks Melissa for posting my pics!